There are two big visiting events happening in September which between them will mean that many more churches will be open over the second weekend of September 2016. Heritage Open Days (HODs) is taking place from 8-11thSeptember across the country. Literally thousands of historic buildings and cultural places are going to be open many of them hosting special activities. Many of them are places of worship. So go to the HODs website and have a look at what is on offer. For instance, I just typed Norwich and churches into the events directory and a list of 13 churches that will be open during that weekend came up. As part of this year’s Heritage Open Days, the organisers have joined forces with the Central Council of Church Bell Ringers with the aim of opening up 500 of England’s bell towers to the public. There will be opportunities to watch the bell-ringers in action and to try your hand at bell-ringing and also to hear about the history of bell ringing and the engineering and the mechanics of ringing ‘dem bells. They also hope to create a collective bell ringing moment on Thursday 8 September at 6pm. You can find out whether there is a bell ringing event near you by checking the events directory on the HODs website. This is the national fundraising day for churches, chapels and meeting houses. 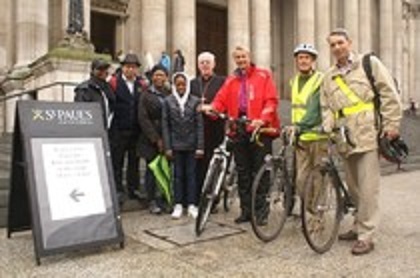 Ride+Stride is a sponsored bike ride or walk in which people all over England walk or cycle between churches, exploring and enjoying the countryside from Cornwall to Northumberland. The money they raise helps to save historic churches, chapels and meeting houses for future generations by helping to fund urgent repairs and the installation of modern facilities. Supported by The National Churches Trust and in partnership with county based local churches trusts, Ride+Stride opens the doors to some of England’s most rare and unusual churches, chapels and meeting houses. It means that there will many more open churches than usual so support them by paying a visit. Find out how you can participate as a church, a cyclist, walker or horse rider. And don’t worry if you aren’t being sponsored, they will be glad to see you anyway.